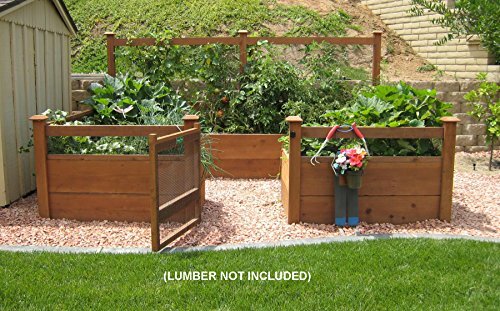 Build the ultimate vegetable garden with this kit. Required rough construction lumber [redwood or cedar suggested, listed lumber is the nominal size, which will likely be larger (thicker) than the actual size]: (6) 2"x10"x12', (6) 2"x10"x8', (5) 2"x4"x12', (1) 2"x4"x6', (4) 2"x2"x12', (3) 1-5/8"x1-5/8"x12' (actual size). Note: the lumber boards will need to be further cut into the sizes described in the assembly instructions. Optional extras: 7 decorative flat bottom post caps, 3'x29' galvanized wire mesh for flooring (1/2" grid) to keep out gophers and moles. For more information visit the GardensToGro website.